Get the most storage bang for your IT buck. ReadyNAS 4360X offers unmatched performance, capacity and reliability storage solution to the SMB. Unlimited snapshots, anti-virus, encryption, block level multi-site backup and recovery, RAID 50 and RAID 60 for enhanced performance and multi-point fault tolerance. In short, ReadyNAS 4360X is the critical component in your data storage, protection and business continuity strategy. With the new RR4360X and RR4360S, Rackmount storage has reached new heights in performance at an affordable price with a 60-Bay model! 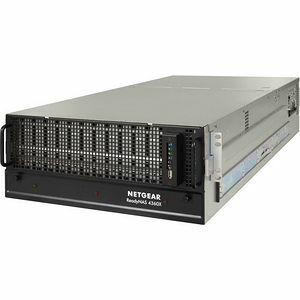 Industry's ultimate performance high density storage and backup up solution - NETGEAR RR4360X - Highest density 60-Bay 10GbE Rackmount network storage System for Small and Medium Size Business, expandable to 132 drive bays and over 1 Petabyte, based on industry leading data reliability ReadyNAS OS with 5 levels of data protection, including Snapshot and Disaster Recovery Capabilities.